DETROIT, Nov. 1, 2018 /PRNewswire/ -- The North American International Auto Show announced today tickets for the 2019 show are now available for purchase on the show's website. Tickets are on sale for The Gallery, Industry Preview, https://naias.com/automobili-d/Charity Preview and Public Show. "The North American International Auto Show offers six unique shows in one; five of which are ticketed for many different audiences," said Rod Alberts, NAIAS Executive Director. "Our 2019 show is going to be a transformative year for the show, and we're looking forward to delivering events that offer something for all attendees—from global executives to car enthusiasts alike." A night of exclusive guests, fine food and the finest luxury automobiles. 2019 marks the 13th year of the ultra-luxury automotive event, The Gallery. Hosted at the MGM Grand, The Gallery guests will experience a multi-million dollar collection of the most acclaimed automobiles the world has to offer, including brands such as Aston Martin, Bentley, Ferrari, Lamborghini and Rolls Royce, to name a few. Tickets will be $500 per person. No other industry event in North America provides an international platform for this vast array of companies, organizations and thought leaders under one roof to connect and share insights with nearly 40,000 automotive professionals and analysts representing over 2,200 companies from around the world. This unique networking and professional development opportunity brings the key individuals responsible for the cutting-edge products, technologies and services on display at NAIAS to Detroit. 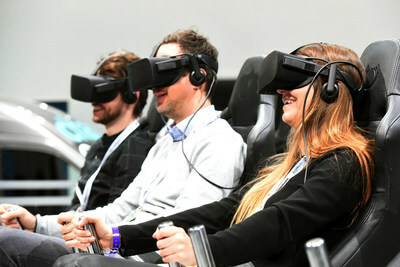 With the addition of AutoMobili-D, Industry Preview attendees are able to experience the latest mobility-focused technologies and innovative platforms from global automakers, suppliers and startups, focusing on autonomous driving, connected car, e-mobility, mobility services and smart cities. Tickets will be $110 per person (shipping and handling fees may apply). The VIP Industry Preview Package will be offered again for the upcoming show. The VIP package provides group ticket purchasers access to the cutting-edge products, technologies and services on display at NAIAS, along with the Atwater Networking Lounge—a private area ideal for small meetings and mobility discussions. Groups purchasing 20 or more Industry Preview tickets will receive two Atwater Networking Lounge access credentials, while purchasers of 50 or more tickets will receive a minimum of five. Early access to the NAIAS show floor on Wednesday, Jan. 16. To purchase Industry Preview group tickets, contact Blake Govan at blake@fulkersongroup.com or 248.388.9398. Charity Preview is your opportunity to be a part of one of the most exclusive, high-profile events in the nation. Enjoy the first views of the spectacular 2019 North American International Auto Show with proceeds directly benefitting a wide range of children's charities. Funds raised will support services for children of all ages from birth to 18. Tickets will be $400 per person, $390 of which is tax deductible. Experience an automotive event unlike any other. At NAIAS, you have the opportunity to see up-close the vehicles and technologies that will shape the future automotive landscape. From muscle and electric cars, to high-performance supercars and full-size trucks, NAIAS has something for everyone to enjoy. Tickets are $14 per adult; $7 for seniors ages 65 and older; $7 for children ages 7 to 12; and free for children 6 years old and under with a parent or guardian.